Poolside wedding ceremonies and receptions are incredibly beautiful - whether in the heat of the day, at sunset, or under the stars, a pool is an elegant backdrop. The reason many couples choose to have a destination wedding is to ensure great weather and to make the whole experience feel like a holiday for everyone involved. Something that we very much associate with a paradisiacal, relaxing and luxury getaway is of course, swimming pools. When the sun reflects on the waters of a pool terrace, an overwhelming sense of serenity arises, so here’s why a swimming pool can be the greatest asset of your destination wedding. Swimming pools are a sign of luxury and leisure, immediately making everyone feel relaxed in its proximity. Poolside wedding ceremonies and receptions are also incredibly beautiful – whether in the heat of the day, at sunset, or under the stars, a pool is an elegant backdrop. At night time they can be lit with spotlights, candles and lanterns, which reflect on the ripples of the water for a romantic atmosphere. To inspire you further, we’ve grouped together some of our favourite poolside wedding venues in the world. 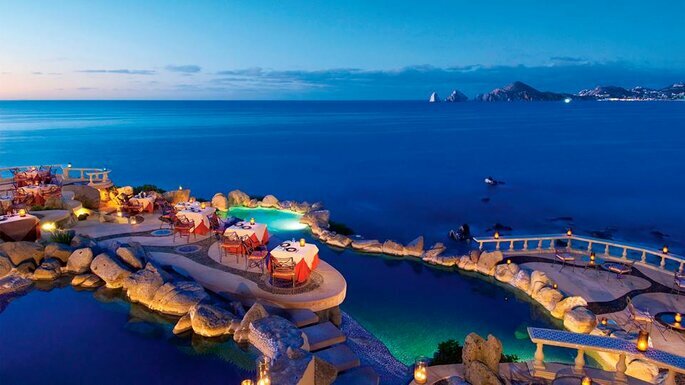 The pools at Sunset Mona Lisa in Mexico give the allusion of a never ending ocean, surrounded by platforms and terraces that are perfect for both small ceremonies and receptions. The team here are very accustomed to helping couples achieve their destination wedding dreams, since they host around 100 weddings a year! The hotel and its event spaces are a slice of paradise, with panoramic views that none of your guests will be able to forget. Not only does La Chiusa di Chietri in Italy have a facade reminiscent of Disney fairytales, but it also has a beautiful pool and terrace for a celebration under the stars. The light turquoise of the pool’s waters is a perfect contrast the the venue’s white-washed walls and luxury white furnishings, offering a very sophisticated and elegant style of wedding reception space. Considered one of the best villas in Bali for destination weddings, Villa Rumi, of Rumi Villas, is suitable for your wedding ceremony, reception, or both. 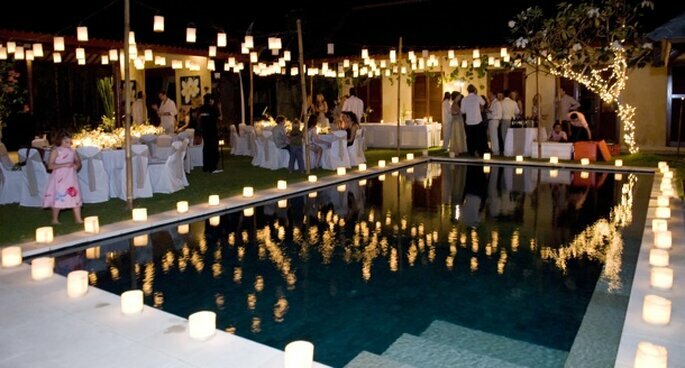 The poolside terrace can be transformed into your dream wedding, with twinkling fairy lights and candles. Perfect for an intimate celebration with close family and friends, and the villa can also be hired for accommodation too, allowing you to feel right at home in a beautifully exotic location. Having a pool amidst your wedding celebration is one thing, but have you ever thought of getting married on top of one? 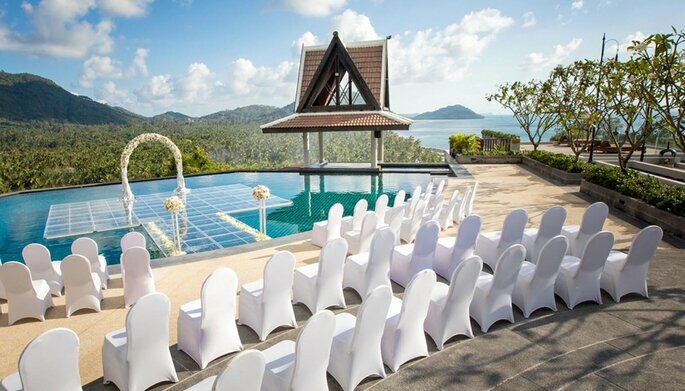 In Thailand, you can tie the knot on a clear platform above a beautiful pool with panoramic views of the mountains and sea. The InterConinental Samui Baan Taling Ngam Resort won the ‘Luxury Wedding Destination – South East Asia’ award at The Luxury Hotel Awards 2017. 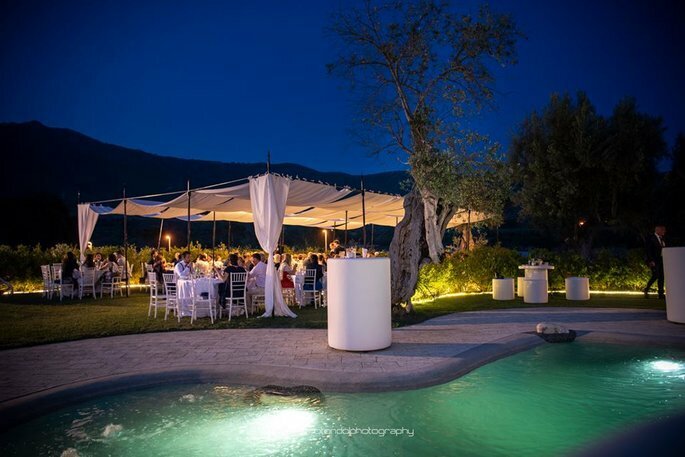 Another gorgeous venue in Italy, Tenuta Re Ferdinando has multiple outdoor spaces for an unforgettable al fresco wedding, but it’s pool area is the most beautiful. Here you can seat many guests, whether an intimate or large celebration. The hotel can also accommodate your guests in their luxury, comfortable rooms, and the expert wedding and events team will be on hand to ensure that your destination wedding runs as smoothly as possible. The Indians certainly know how to celebrate weddings, one of their most sacred events. India is also known for it’s incomparable hospitality. 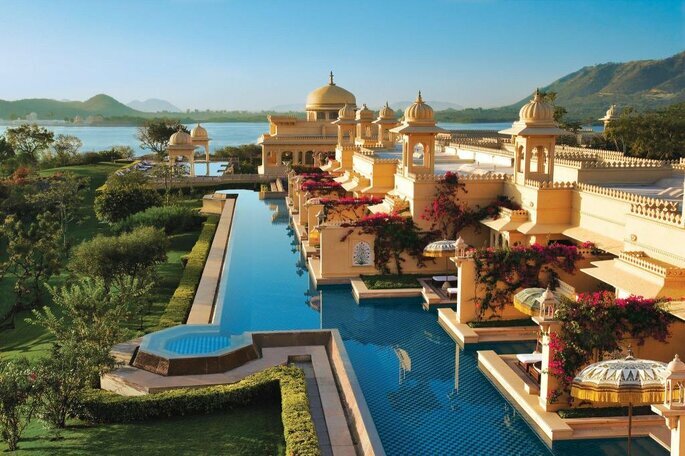 So combine both of these for a unique destination wedding in the beautiful Udaipur, where you’ll find this incredible 5 star hotel,The Oberoi Udaivilas. The architecture and landscape of the building, its gardens and its pools are a feast for the eyes! Tropical tranquility, island bliss and romantic exclusivity defineLas Terrazas Resort, set on the crystal blue waters of the Caribbean Sea. 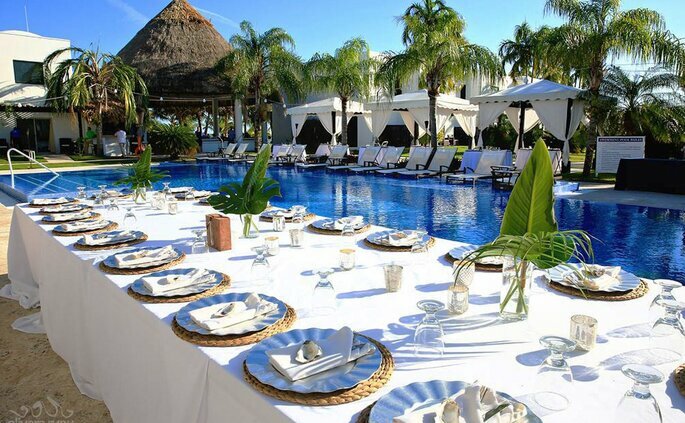 You can celebrate with your awe-inspired guests surrounding a 70-foot infinity pool. The resort is also the perfect place to kickstart your honeymoon, with an indulgent spa, candle-lit beach dinners, and incredible snorkelling, kayak or catamaran adventures. 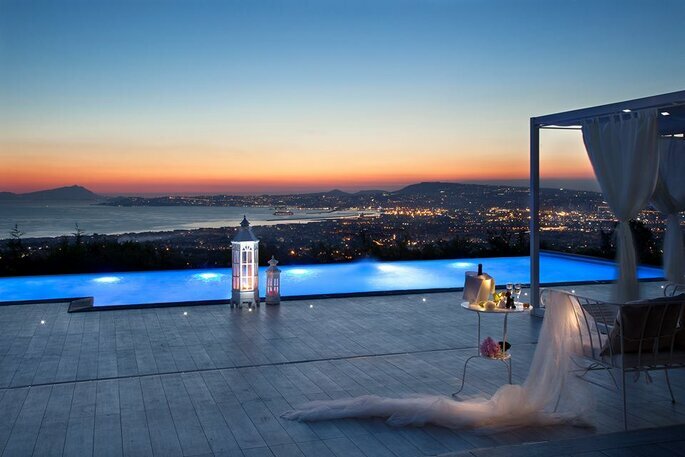 And finally, our favourite destination wedding venue in Naples. One of the main attractions of Villa Andrea di Isernia is its panoramic pool terrace that overlooks the glittering lights of the city and the glistening waters of the sea. The venue specialises in destination weddings, striving to show couples and their guests the very best of Italy: delicious food, impeccable hospitality and the beauty of its landscape. We hope to have inspired you with some of the most beautiful poolside wedding venues around. There really is something special about water features at events, especially as the sun sets on your celebration, casting a soft and elegant glow. Beautiful beaches, unbeatable culture and entrancing nature are the three pillars of this Caribbean country that will transform your honeymoon into the immense journey that you deserve. Cruises can be an amazing alternative to settling in just one destination for your honeymoon. With the chance to visit a variety of different locations, check out the best cruises available right now for your first trip as newlyweds! The most well-known country in the East is also a mystery because of all the secrets it holds. For a honeymoon, it's a total adventure in all senses of the word. Visiting Africa without experiencing a safari or relaxing in a lodge seems crazy. With these professionals on your side, any adventure on the continent will ooze magic, excitement and romance, paired with luxury accommodation for a complete honeymoon experience. Many couples choose to chill by the beach for a week for their honeymoon, but if you want to do something different, then look no further! Your honeymoon will be one of life's greatest adventures. It finalises the wedding and will mark your first trip as newlyweds.Therefore, during your extensive wedding planning, don't forget to devote some planning time to organise your honeymoon. Here are five factors to consider when choosing your romantic destination. South Africa is not just becoming the adventure capital of the world, but is also one of the most romantic places in the world for your honeymoon. So learn more about this incredible country now!